Translation and the Making of Modern Chinese Culture.Oxford: Oxford University Press, 2013. 320 pp. The period of Chinese history that saw the fall of the last dynasty and the beginnings of a republic was characterized by an extremely broad range of debates about writing, literary forms and activities, about language, about philosophical and political systems, about gender and equality, about the very past and future of the nation’s cultural foundations. It is a period that still requires much detailed research since we still have not read enough, analyzed enough or taken available materials seriously enough. We do not have the details of what is often simply portrayed as a period when youth and progressive intellectuals replaced the literati, those remnants of the past who hung on to a “feudal ideology.” Such a portrayal has been questioned and disproven often enough, but clearly not often enough to displace it entirely. There is still a lot of digging to do in the period that marks the final years of the nineteenth and the first years of the twentieth century. Michael Gibbs Hill has set out on a very laudable archaeological project to uncover one of the sites of cultural production that can help us understand the various quarrels, debates, and battles for the power to create the new definitions of the new era. His material consists of “the works of Lin Shu and his collaborators” and “the important perspectives on the transformation of mental labor and intellectual work in modern China” (2). He wishes to avoid the “polemical historiography of the May Fourth period” (7-8) that has denied Lin and his collaborators their rightful place in the history of the period and their important role, as Hill puts it, in “the making of the modern intellectual in China” (3). Through analysis of Lin Shu, Inc.—“the network of individuals occupied with translation and the reproduction of texts from earlier periods of Chinese history”—Hill further aims to show how these individuals constituted “a peculiar dimension of Chinese cultural modernity” (6). This is not a small claim! Previously viewed as a cultural conservative, Lin Shu now comes to occupy a position as a leading intellectual at the center of the modern transformation of mental labor and intellectual work. After reading these claims of the introductory chapter, the reader is eager to see how Hill will develop the argument in main body of the book, chapters 2 to 7. Chapter 2 opens with discussion of Lin Shu’s translation method, which has regularly been pooh-poohed in historical overviews because it was a form of “tandem translation”—a collaboration between those who could read the source language and those who could not but could write well in the target language. The target language in Lin Shu’s case was the classical style of Chinese that would soon be replaced by writing in a more vernacular style. As Hill rightly observes, we should be wary of seeing the classical language as a monolithic, unchanging entity that hindered cultural and social progress; it was, however, in its contemporaneous form, doubtless the only available language for learned Chinese gentlemen who engaged in translation at the end of the nineteenth century. Moreover, as Hill further observes, translation at this time became an activity central to all efforts at change in China and often provided the basis and authority for argumentation in both the political and cultural realms. It often served to reinforce the pervading narrative of Chinese cultural lack or deficiency that can be found in so many Chinese treatises of the time: a lack of proper literature, a lack of science, a lack of hygiene, etiquette, modern education, etc. Lin Shu is thus presented as using the tools available to him at the time—collaborators and classical Chinese—in his contribution to national salvation, tools that only became “broken” (as the author puts it) in or through later historiography. Chapters 3 through 5 show how Lin Shu and his collaborators used their tools of tandem translation and classical Chinese in their actual translations, particularly in their renderings of Uncle Tom’s Cabin and Aesop’s Fables (chapter 3), Oliver Twist and The Old Curiosity Shop (chapter 4), and translations of Washington Irving stories (chapter 5). In Chapter 3, Hill pays much attention to the use of modern terms within Lin Shu’s classical language, and he points particularly to the ubiquity of what he calls “key terms . . . in Western Learning” at the time (55), terms such as gongli 公理 (universal principle) and gongfa 公法 (international law). Unlike Yan Fu (1853-1921), Lin Shu’s reworkings of foreign texts were clearly often more in sync with changes in language use in China at the time, but is this as spectacular a development as Hill would have us believe? His pronouncements in this regard can be taken as typical of the often somewhat exaggerated and theoretically overburdened conclusions drawn from exciting empirical material. In his conclusion to the section discussing the alterations and shifts in the text of Uncle Tom’s Cabin, we read that the Chinese text “shows how the self-reflexive practice of translation, especially in its meditation on the conditions of its production—in this case, the convergence of ancient-style prose, Western learning, and ‘universal principle’—can create deep funds of imagery that find themselves used by actors across the cultural and political spectrum” (77). Apart from the fact that the issues of the “self-reflexive practice of translation” and “meditation on the conditions of production” are not dealt with in any depth in the chapter, is the author really suggesting that Lin Shu’s copious use of new terms in his translation of the novel in question caused others to use them more? Is it not, rather, simply evidence of the way new terms seeped into the language until they became almost unavoidable, either in the learned classical style or the modern vernacular? In other words, were neologisms not just part and parcel of an evolving and multidimensional classical Chinese? A similarly far-fetched claim is made for the translations of Aesop’s Fables. These are, according to Hill, nothing less than a “primer of master terms and concepts central to the writings of many late-Qing intellectuals and reformers” (83). Moreover, the physical appearance of the Chinese version of the Fables and the mode of advertising for them are seen as placing “both Lin Shu’s labor and xiaoshuo into a package that, by virtue of its material form, was ‘equivalent’ to the textbook” (82). By the early years of the twentieth century, xiaoshuo (fiction) had been theorized as having to be educational to be acceptable, but as Hill clearly states a few pages before this conclusion, the Fables were categorized not as xiaoshuo, but yuyan (fable)—a taxonomic difference that one could well think more about. Hill’s claims about Aesop’s Fables are problematic, given the late Qing urgency for categorizing different kinds of fiction (historical, political, educational, sentimental, detective, to name just a few). The Unofficial Historian says: no system [of justice] in the world can be as bad as what is found in our England. For such a small crime, [Oliver] is thrown into a worse cell than those used to hold condemned men in Newgate. If you do not believe it, my readers, then go there and see for yourself (106-7). The fascinating readings of Washington Irvine works are also marred by extreme claims for the material. Thus these readings are described as tracing “the movement of modern nostalgia” (127) and as “a rediscovery of traditionalism through the process of translation” (141). “Moments of transcendence” are located that offer “a utopian vision of global literary modernity that does not, in its expansion, eliminate the unique modes of expression in one locality” (149). Again, none of these “big terms”—nostalgia, traditionalism, literary modernity—are dealt with in any detail even though they themselves are the kind of floating signifiers around which much controversy revolves. Before turning to the final sections of the book, I want to emphasize how important this study is. An obviously meticulous and conscientious reader has spread before us a treasury of insights into Lin Shu’s writings, his activities, and his life at a complex period of literary history. 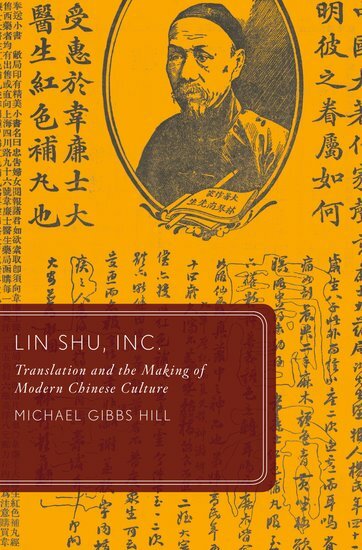 Hill has produced some very valuable research that contextualizes the material expertly and shows a sensitivity to language and a deep understanding of textual production in traditional and transitional China. Yet instead of letting this excellent research speak for itself and thus offer a further layer of important material to the (slowly) growing body of research on the details of late-Qing and early Republican writing, the author overloads it with huge theoretical categories that, in the end, tend to undermine his actual findings and confuse the reader. There are different books to be written about the transformation of mental labor and intellectual work in China, on the making of the modern intellectual in China or on dimensions of Chinese cultural modernity. They just do not necessarily need to revolve around Lin Shu or, if they do, they need to deal in detail with each of these categories of analysis and to place the author and the material within a long line of previous discussions. This is simply not done here. Can we not shout out to young scholars that, when they (as in this case) have shown themselves to be in command of their empirical base and able to place this in both the narrow and broad historico-cultural context, they are already doing the academic community a great service? They are extending our knowledge and making available otherwise unavailable material. Such results are excellent in themselves and do not need “prettying up” with theoretical enhancers. This is not in any way to state that I eschew theory or theoretical concepts, simply that I do not want to be distracted from good scholarship by tagged-on enigmatic statements. Returning to the body of the book, the final two chapters offer a broadening of the scope of enquiry in that they leave Lin Shu the translator and look into some of his lesser known activities as textbook writer and editor, as anthologizer and correspondence course creator. The materials presented here open up a new side of Lin Shu and add to our understanding of the period, even though, again, some very extreme claims are made for the insights gleaned. In the final chapter, with the title “Becoming Wang Jingxuan,” Hill makes intelligent use of the famous hoax by writers atNew Youth to shed light on the manner in which Lin Shu was first subject to odium and then faded into obscurity. Lin Shu was just one of the casualties, though perhaps one of the better known in literary histories in and outside China, of the transitional era where much was at stake and the battles of and for words and texts were regularly fought with great ferocity. Lin Shu was a voice, an important voice, in the cacophony of voices shrilling through China’s centers of intellectual activity in the late nineteenth and early twentieth centuries. We can be very grateful to Hill for making this voice more audible, placing it in the context of its times and opening up more territory for investigation to the scholarly community in this generally very readable book. The book closes with a short conclusion that looks at some aspects of translation in China after Lin Shu’s death and reasserts, equally unconvincingly, some of the broad claims presented in the individual chapters and discussed above. Hill is completely right, however, when he writes that we should read “beyond the boundaries of the archive that often defines modern Chinese literary and intellectual history” (238). There are so many areas of the late-Qing and early-Republican era that are still waiting for the light of scholarly inquiry, but this reader is convinced that there is still more need for the electrician than for the theoretician!